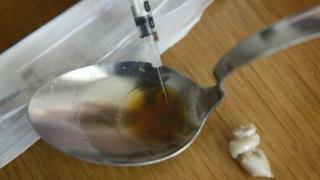 The Scottish government is drawing up a new drugs strategy, saying that "each of these untimely deaths is a tragedy". The newly released figures show a steady rise in deaths since 2013, with the rate of deaths now "very roughly two and a half times that of the UK as a whole" and "higher than those reported for all the EU countries". Males accounted for 70% of the deaths, while 39% were of people aged 35 to 44 - compared to 29% being in the 45 to 54 age group and 20% in the 25 to 34 cohort. Opiods such as heroin, morphine and methadone were linked to 87% of the deaths, while benzodiazepines like diazepam were linked to 59% - reflecting that multiple substances were implicated in many cases. The Scottish government is currently drawing up a new drugs policies, to update the "road to recovery" strategy which has had £689m invested in it since 2008. New public health minister Joe Fitzpatrick offered his "deepest condolences to the families and friends who have lost loved ones over the last year". He said: "We will continue to do all we can to prevent others from experiencing similar heartbreak and we are developing a refreshed substance use strategy. "This is in direct response to the changing drugs landscape, the continued rise in drug related deaths and the recognition that current services do not meet the needs of all the people who need support." Drug and alcohol charity Addaction said the deaths were "a terrible waste of life", saying it was "plainly obvious that the current system isn't working". Director Andrew Horne said: "We need to be investing more in substance misuse so that we can help people reduce harm, stay safe and ultimately start out on their personal recovery journeys. "We are working with the Scottish government in developing a new bold drug and alcohol strategy to make services fit for the 2020s. In particular, Addaction is working hard to make our services more accessible - we will never be able to stop all drug and alcohol-related deaths but we must make it our mission to do more." David Liddell of the Scottish Drugs Forum noted that more than 10,000 people had died since records started in 1996 - "the equivalent of the entire population of a Scottish town". He said: "For the cost of providing a dual carriageway on a few hundred metres of the A9, we could substantially prevent these deaths amongst some of the most vulnerable people in Scotland and prevent families and communities suffering this loss. "That means making sure there is accessible high-quality healthcare and support, like the rest of us are afforded when we are ill, and removing people from the dangers of unregulated street drugs." The Scottish Conservatives said "a radical and urgent" drugs strategy was needed, with the "atrocious statistics" making it clear that current approaches were not working. Public health spokeswoman Annie Wells said: "People are sick of the drugs scourge in Scotland which is massively worse than anywhere else in Europe. By working together, all parties in the Scottish Parliament need to contribute to a new strategy that can start turning this appalling situation around." Scottish Labour said the "absolutely shocking figures" should be a "a wake-up call" for ministers. Party leader Richard Leonard tweeted that it was "clear the SNP government's drug strategy has failed", saying: "We need a full and open debate over how we move the country forward to end this crisis in our towns and cities." The Scottish Greens called for a "serious overhaul" of drugs strategies, while the Lib Dems said the government should "hang its head in shame" over the figures.